I came to the Buddhist path as a seeker. I was skeptical about religious claims, but felt a deep void in my life. I yearned for meaning and truth in a unpredictable and often hostile world. In Buddhism, I thought I had found what I was searching for. Buddhists has never started a war. There was never a Buddhist Inquisition. They emphasized wisdom, compassion, lovingkindness, and personal transformation. And they certainly never threatened me with eternity in a lake of fire. But it was not meant to be. That deep void in my life? It was what has often been described as a “God-shaped vacuum”—the emptiness that only God can fill. We are His creation, made in His image. He intends for us to have a relationship with Him and, when we are without Him, we feel empty and alone. No matter how long I meditated or what teachings I read, I could not fill this emptiness in my life. For in Buddhism, there is no sovereign, loving Creator. True, some Buddhists purport to believe in a god, or in a realm of higher beings called devas. 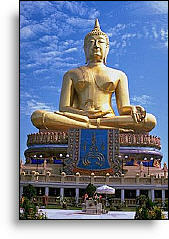 Others pray to statues of Buddha (Siddhartha Gautama). But as a whole, Buddhism is not a theistic religion. It has a law—the law of karma—but no lawgiver. According to the Buddhist worldview, all beings accumulate karma based on their actions, and karma dictates their life circumstances. When a person dies, the karma accumulated in that lifetime (and all previous lives) determines his or her lot in the next life. To many Buddhists, this means that a person born into a wealthy family has good karma, while someone who lives in a poor, disease-infested village would have accumulated negative karma. Buddhists believe karma keeps one trapped in an endless cycle of death and rebirth (samsara), and the only way out is through enlightenment. To become enlightened, one has to eliminate desire. Buddha taught that desire is the root of suffering; that it causes attachment, which leads to suffering, and in turn causes other beings to suffer. This produces negative karma. If one eliminates desire and stops causing suffering, one can become enlightened, as he had. But eventually I began to question. Who or what had set this law of karma in motion? Who judged these beings' actions and sentenced them to another life of pain? Why were beings punished for actions they would be unable to remember? Was desire always a bad thing? Wasn't the desire for enlightenment still desire? If so, how could one ever attain enlightenment? So I strayed from the Buddhist path, the emptiness within me greater than before. I began to examine the claims of Jesus of Nazareth in a new light, laying aside the biases and prejudices that had caused me to dismiss Him as merely a “great human teacher.” The more I searched, the more I came to believe that there was a sovereign God who loved me and that Jesus was who He claimed to be—the Son of Man, fully human and fully God. I accepted Christ into my heart. In doing so, I now feel that I've found true enlightenment—through a personal relationship with my Creator. What's more, I discovered that what I had sought through the Buddhist path—wisdom, compassion, and lovingkindness—were found in the life and teachings of Jesus Christ. The supreme act of compassion was His sacrifice on the cross—that while we were still sinners, He died for us. No human alive could ever demonstrate this kind of unselfish, unconditional love. No human can match God's divine mercy and lovingkindness, no matter how long we meditate or what books we've read. Yet we must try, for when we receive Christ, we become a new creation and begin the process of becoming Christ-like. The apostle John wrote. “He who says he abides in Him ought himself also to walk just as He walked” (1 John 2:6, NKJV). If this kind of personal transformation is not enlightenment, I do not know what is. To me, having a personal relationship with God and the assurance of salvation brings true peace. And it's ours if we but ask for it! Frosbel, please keep to your limit of criticising false christian doctrines. OH! FROSBEL, Honestly it is now that I have understood what your problem really is. OH what a pity, haven gone through many threads of yours on Nairaland, I discovered that you have spent all your past life on Religious Prosti.tution. First you were in the Catholic church, where you were a youth leader. Suddenly you stop praying the rosary and became Anti-catholic. From there you land yourself into one of these mushroom penticostal Churches were they defrauded and stole 10% of your monthly earnings all in the name of tithes. From there you must have tried many protestant churches before you got tired of Christianity. Then you left Christianity for other world Religions. As evident as is it, you narrated here, your experience with Buddhism, I will be happy to see your subsequent threads narrating your experience with Jewdaism, Islam, Hinduism, Zorastranism, Shinto, Peganism, etc. From one of your threads this year, I learnt you are back to Christianity and you are now a member of a Non-denominational Penticostal DENOMINATION where they "DON'T NEED CHURCH BUILDINGS" or a particular place of worship. Where members are free to worship anywhere whatsoever they choose. All these explains the reason why you are now attacking the catholics, the anglicans, all Protestant denominations and all the world religions you have praticed. As we can see today is for buddhism. I just hope you woun't launch a thread, tomorrow attacking the very Non-denominational DENOMINATION you are in right now, honestly that will be a sign of "RELIGIOUS MAD NESS." Lovethywilbedon: OH! FROSBEL, Honestly it is now that I have understood what your problem really is. OH what a pity, haven gone through many threads of yours on Nairaland, I discovered that you have spent all your past life on Religious Prosti.tution. First you were in the Catholic where you were a youth leader. Suddenly you stop praying the rosary and became Anti-catholic. From there you land yourself into one of these mushroom penticostal Churches were they defrauded and stole 10% of your monthly earnings all in the name of tithes. From there you must have tried many protestant churches before you got tired of Christianity. Then you left Christianity for other world Religions. As evident as is it, you narrated here, your experience in Buddhism, I will be happy to see your subsequent threads narrating you experience with Jewdaism, Islam, Hinduism, Zorastranism, Shinto, Peganism, etc. From one of your threads this year, I learnt you are back to Christianity and your now a member of a Non-denominational Penticostal DENOMINATION where they "DON'T NEED CHURCH BUILDINGS" or a particular place of worship. Where members are free to worship anywhere whatsoever they like. All these explains the reason why you are now attacking the catholics, the anglicans, all Protestant denominations and all the world religions you have praticed. As we can see now it is time for buddhism. I just hope you woun't launch a thread, tomorrow attacking the very Non-denominational DENOMINATION you are in right now, honestly that will be a sign of "RELIGIOUS MAD NESS." Honestly *FORSBEL* you won't stop FASCINATING me. Okay let me qoute the title of your thread for you [Straying from the Buddhist path-"WHY I STOPPED FOLLOWING BUDDHA"] Now please tell me *Frosbe* WHERE WERE YOU YOU FOLLOWING BUDDHA? before you "STOPPED", as a Catholic or as a Christian? Please let me know, I am very intrested in this STORY of yours. Lovethywilbedon: Honestly *FORSBEL* you won't stop FASCINATING me. Okay let me qoute the title of your thread for you [Straying from the Buddhist path-"WHY I STOPPED FOLLOWING BUDDHA"] Now please tell me *Frosbe* WHERE WERE YOU YOU FOLLOWING BUDDHA? before you "STOPPED", as a Catholic or as a Christian? Please let me know, I am very intrested with this your STORY. This is not about me, it is the story of someone who in their search for the truth came to find it in JESUS Christ. Hah! Frosbel you are very clever. I am talking about the "TITLE" of your thread. If you are really not the person don't you think it should be "why he stopped following Buddha" rather than "why I(first persons pronoun ie frosbel himself) stopped following Buddha. Lovethywilbedon: Hah! Frosbel you are very clever. I am talking about the "TITLE" of your thread. If you are really not the person don't you think it should be "why he stopped following Buddha" rather than "why I(first persons pronoun ie frosbel himself) stopped following Buddha. Hold it Big Brother, I think frosbel is free to title his thread as he deems fit without the All Seeing Eye censoring him and telling him what he is supposed to say and how he is supposed to say it. Please stick to being a moderator and leave dictatorship to Maclatunji. EDIT: Ah I see you've changed it for him.....please change it back to frosbel's original topic and allow him control of his thread. Authoritarian dictatorship is not your style.